Singapore is known to many as an urban city within a nature park. It is no surprise that it is home to beautiful gardens, reservoirs and parks that are easily accessible for you and your family to enjoy. If you like being immersed in nature, or would enjoy an occasional breather from the hustle and bustle of the city life, or even to have your daily running session outdoor, we have got a lovely list of nature parks in Singapore for you to explore! Be it that you are living permanently in Singapore or visiting as a tourist, these parks are great for you for, sightseeing, trekking and even having a lazy afternoon with your book and a picnic basket. Read on to find out what they are! Located at near Upper Thompson, slightly away from the central area of the sunny island, Windsor Nature Park is one of the new green zones that have been opened to the public recently. It is part of the plan to surround the reservoirs of the island with a green buffer to help ease the pressure and stress of the nature reserves in Singapore. The Park is home to native plants as well as freshwater streams and a marsh habitat. There are three hiking trails and a 150-metre sub-canopy walkway in the 75-hectare park, which we believe would be an easy and lovely hike for you and your loved ones to enjoy. Any list of nature parks in Singapore would not have missed this UNESCO World Heritage Site. Why? Because it is the home to an impressive oasis of greenery. From green plants to cacti, orchids and more, this tropical botanic garden has a garden just for kids too. 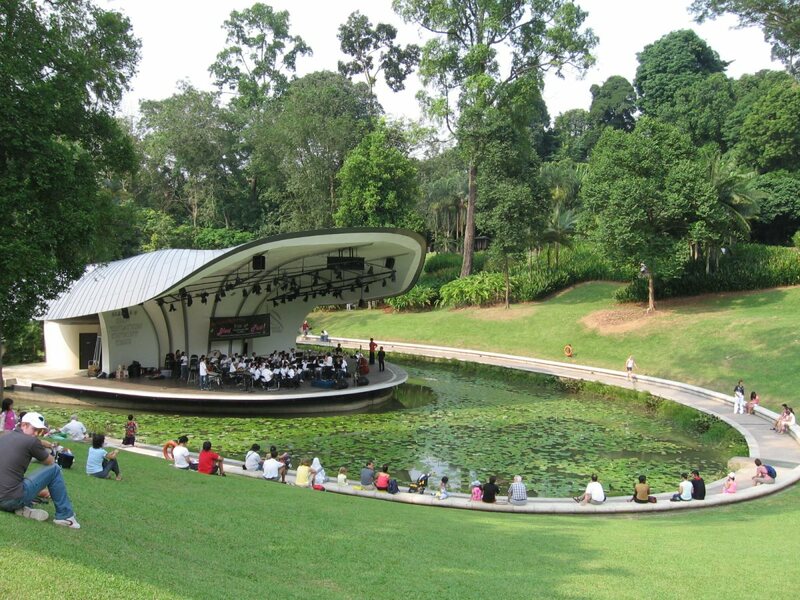 A lake with an amphitheatre where plays, dance performances and symphonies are showcased. So if you are looking at a day of just chilling or basking in nature’s ambience while you enjoy a play or theatrical arts, this is probably the one and the nicest garden to be at. Hort Park is located at the southwestern part of Singapore. It is designed to be a recreational and educational park which includes a good amount of show gardens to inspire the locals to adopt gardening as a hobby or to express their love for it. A quiet picnic or a session of restorative yoga there would definitely help yield some healing benefits for your mind and body. A 250-meter aerial suspension bridge that let you enjoy a panoramic view over the surrounding rainforest and Upper Peirce Reservoir is the HSBC TreeTop Walk. It is the highlight of the MacRitchie Reservoir, a popular spot for running trails. If you are not too keep of heights, take the meandering lakeside boardwalks and enjoy the view of calming waters or hike through the forest on a cross-country trail. One of the iconic attractions of Singapore today has surely got to be Gardens by the Bay. Located at the central area of bustling Singapore. Spanning 101 hectares, the design by British architects Wilkinson Eyre and landscape architects Grant Associates feature towering supertrees and 2 indoor nature habitats: Flower Dome and Cloud Forest perfect for the urban explorer to get in touch with horticulture and garden artistry. Though a fee is required to enter the indoor habitats, we think that they are an eye opener for anyone that enters. Alternatively, a complimentary walk around the garden trail can be revitalising for many too. If you like history, art to go with the charms of Mother Nature, be sure to make a journey to Fort Canning. It is established in 1859 as a barracks, hospital and arms store and now, transformed to a place that exhibits art in the barracks and attraction that includes Sir Stanford Raffles’ personal bungalow and a beautiful Spice Garden that is a replica of the one by Raffles in 1822. If there is a place that is unique to Singapore due to its location by nature, it would be Sungei Buloh Wetland Reserve. It is a place where you can learn about mangrove swarms in person and watch birds as well as the other wildlife living in the freshwater wetlands. For the best time to bird watch, visit this reserve with your loved ones (especially the kids) during the migratory season in September to March. For an interesting hybrid of planting, landscaping, Chinese architecture, take a stroll in the Chinese garden located at Jurong East. It has a biking trail, a towering Chinese Pagoda, a tortoise museum and an extensive bonsai garden. It is a great picnic spot and provides you with an opportunity to check out oriental design details.